Available as a Mattress, or Mattress Set with Split Foundations (Please choose this option from the drop down menu). California King Size measuring approximately 72 inches x 84 inches. Interchangeable Latex & Memory-Cell® 3-D Pillow Top. Designer PetMe™ - Stretch Knit Cover. 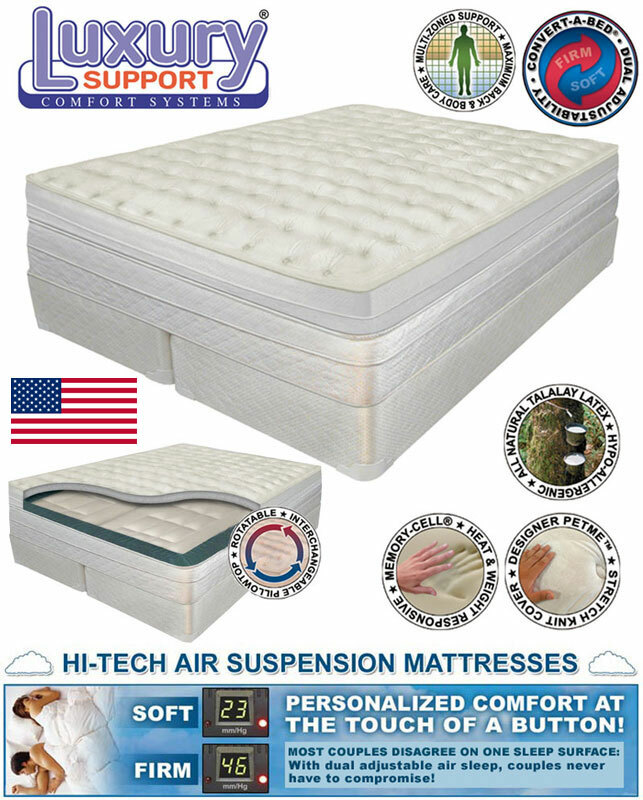 Naturally Anti-Microbial Talalay Latex Reversible Comfort Layer. Contouring Temperature Activated Memory-Cell® Reversible Comfort Layer. Rotatable, Replaceable, Interchangeable Pillow Top. Deluxe Eclipse Pump with incremental Controls. Fully Assembled Foundation. (King & Queen Sizes Are Split Foundations - As Pictured). 95% of orders for this item ship in 7 business days. Please allow for standard ground transit times. If you choose the mattress set with split foundations it will be a curbside freight delivery. Please call 740-593-5000 for specific delivery questions. Personalized Comfort at the touch of a button. While most couples disagree on one sleep surface, our dual adjustable air sleep system couples never have to compromise! Recognized world-wide as the premium Latex. The Talalay process insures the highest quality and performance standards for naturally antimicrobial, long-lasting and earth friendly sustainable Latex. Temperature responsive space-age material contours to the body for even weight distribution to eliminate pressure points. Sculptured PetMe™ Belgian stretch knit cover material offers the incredibly comfortable feel of luxurious Mink. Pillow Flex - New age foam has contouring plush feel of fiber, while resisting the body impressions associated with fiber. Multi-Zoned Body Balance Support & Posturized Mid-Body Support - Optimizes support physics and provides separately designed zones for head-to-toe comfort, stand tall posture alignment. Moisture Barrier backing on pillow top, not found on competitive models, protects internal components for long trouble-free life and a healthier sleep environment. Smart Top - Removable top cover is refluffable and refreshable for years of healthy sleep. Proof Positive Power Edge offers comfort whether sitting on the edge or lying on the mattress. This item is covered by the manufacturer's warranty which includes 5 years no cost replacement parts and a pro-rated extended warranty. Please contact us for details. We do not allow returns for this item. The firmness is easily adjustable with digital controls to suit your needs. Please call 740-593-5000 with any questions before ordering. The California King Size Medallion Dual Chamber Adjustable Comfort Air Mattress features a reversible Talalay Latex and Memory-Cell top. Each side can be individually adjusted for firmness using the Eclipse Air Inflator air control which is a super-quiet, quick-fill, air inflation system.